Ministry of Propaganda - 09/Apr/2007: "Hillwalking in Wales"
The walk started off quite level through Abergavenny, following a few roads. 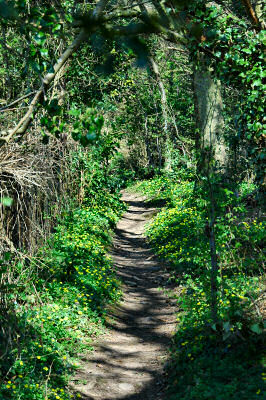 Once I had left Abergavenny I walked along a beautiful path through some trees with the first green of the year, flanked by yellow flowers on the right and left. The walk continued up the hill and after another mile or so left the trees behind. 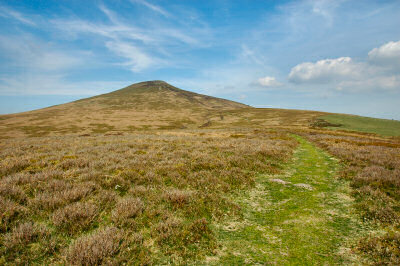 Now the summit of Sugar Loaf (596m/1,995ft) came into view. 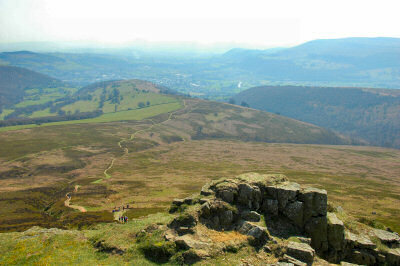 After approx 1.5 hours of walking (incl photo breaks) I arrived at the summit of Sugar Loaf. Unfortunately it was quite hazy, so the views weren't as good as I had hoped. I could just make out Abergavenny below, but most of what would have been visible in the distance was obscured by the haze. A short drive took me to the Nantyffin Cider Mill Inn at the junction of the A40 and the A479, from where I left for my second walk of the day. The climb started almost immediately after leaving past Llwyn-crwn, making my way up to Cwm Mawr. 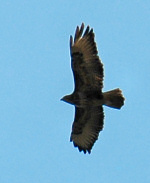 Here I saw a buzzard circling above. Turning east I continued climbing until I was just below the crags of Darren. From here I had a quite nice view west over the Usk Valley with Myarth (292m). After about 1.5 hrs over sometimes quite rough ground I arrived at Table Mountain. This distinctly shaped mountain is the site of a 2,500 years old hill fort called Crug Hywel (same as the town, Crickhowell is the anglicised version). 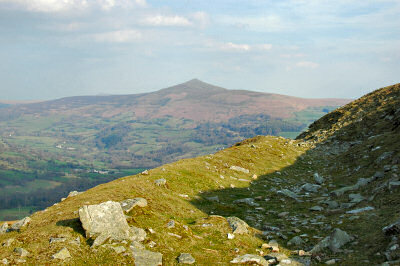 Sugar Loaf, where I had been earlier in the day, was clearly visible in the distance. 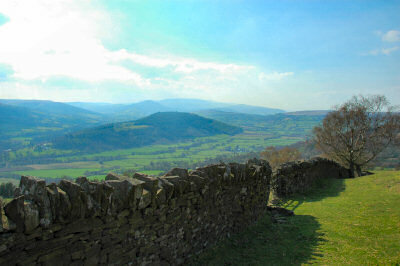 From Table Mountain I dropped down to Crickhowell, where I joined the footpath along the River Usk. 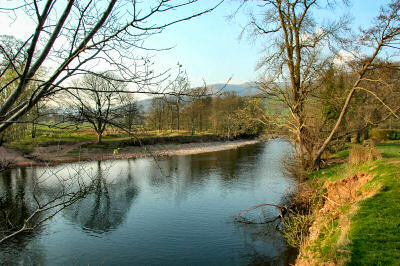 Some very pleasant walking along the river in the later afternoon (or better early evening) sun. Just over three hours after I left I arrived back at my car. Approx 15 miles (and about 1,000m in height gain) in about 7 hours of walking incl photo and lunch breaks. The drive to Wales had been worth it. I had hoped to have my dinner at the Nantyffin Cider Mill Inn, but they don't serve food on Sunday evenings. Hoping to find something on the way I left and instead of taking the M4 took the A40 to Gloucester. I stopped at the Crown Inn in Lea (no website I could find), where I had a burger with chips. Just gone half past nine in the evening I arrived back in Swindon after a great day out, time for a relaxing bath for my aching legs after all the walking.